Rib, Hernia & Abdominal Support. - Padded wrist brace with palm and dorsal reinforcement - Splints individually adjustable and removable - Breathable material provides optimum comfort THE GENERATION-BENEFIT - Can be put on with on.. 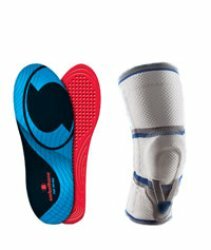 DESCRIPTION : Compression calf support After injuries to the calf, for treating sports injuries, for example ruptures of the muscle fibre, muscle injury .. DESCRIPTION : Simple round knitted knee support for easy stabilisation Easy to handle Not bulky Can be worn on the left or right Sports injuries, articular effusion, sprains, contusions ..
Elbow compression support - Anatomically contoured knit for optimal fit - Compression class II ..
- Elastic compression support for umbilical hernia - Anatomically concaved umbilical hernia pad, with adhesive layer for individual positioning - Two supporting splints - Elastic, breathable fabric w.. DESCRIPTION : Elastic support Velcro fastening Easy to wear Tenosynovitis, strains and after removal of plaster cast .. Description: ULTRA CONVENIENT: Hook and loop bands ensure a snug fit, make closure easy and eliminate the need for taping. EXTRA PADDED polyester splint will keep your fingers dry, clean, and pai.. DESCRIPTION : Re-Derma is the antidesquamanti socks online for the welfare of your foot, composed of anti-friction in copper fiber fabric, with no seams. It protects your foot wrapping it softly,.. Description : Used to protect bandaged finger from dirt, irritation, further injury. .. DESCRIPTION : Sorbothane’s unique viscoelastic material mimics the characteristics of human flesh and absorbs 94.7% of vibrations on impact. Super lightweight ventilated design. Abrasion-resista.. DESCRIPTION : Sorbothane® is a proprietary visco-elastic material. Sorbothane® absorbs up to 94.7% of impact shock before it enters the body It helps protects the entire body from damage due to .. Description: No tape required. Fits any finger. Attaches with hock and loop straps. ..